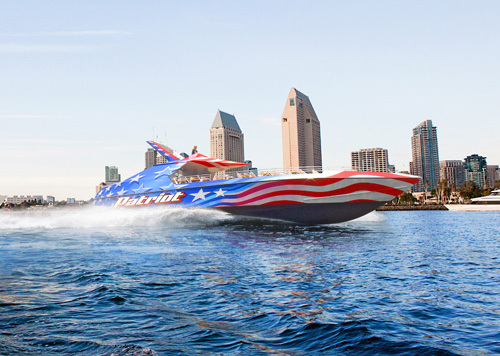 Offered by Flagship Cruises & Events, the Patriot Jet Boat Ride lets guests enjoy a thrilling jet boat ride with 360-degree turns, sharp spins and ultra-fast speeds. 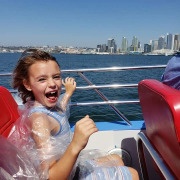 Each 30-minute ride offers complete entertainment as waves crash, music plays and winds roar over San Diego Bay. Passengers will love experiencing the speed of two turbo-charged engines with more than 1,400 horsepower each. Spins, tricks, and turns performed by skilled captain. Spectacular San Diego views and photo opportunities. Cruise San Diego Bay at high-speeds. Children must be 4 years or older. 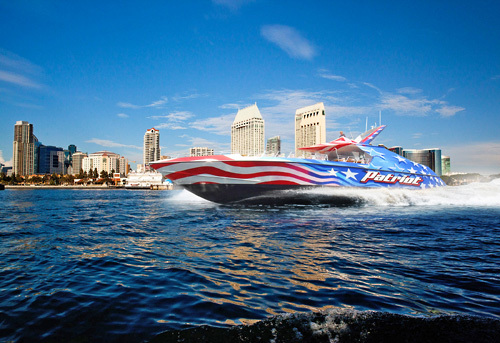 The Patriot is the newest and most thrilling tour San Diego has to offer! 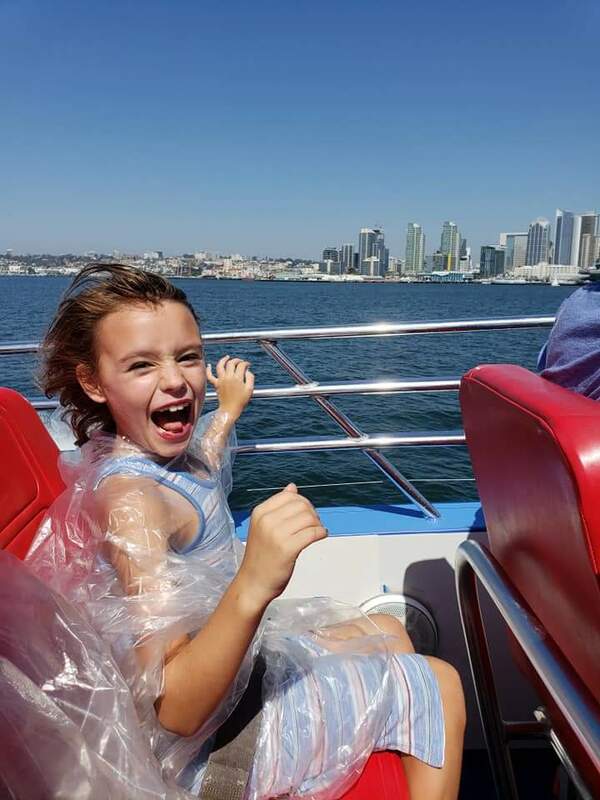 Climb aboard and hold on for this exciting 30-minute thrill ride on San Diego Bay. You will be thoroughly entertained as the waves splash, the music plays, and the wind roars on this tour of a lifetime! It's a blast on the bay while cruising on the Patriot. It departs from 990 N. Harbor Dr. next to the U.S.S. Midway, home of Flagship Cruises & Events. With two turbo-charged engines over 1,400 hp each, passengers will zip past the Coronado Bridge and zoom around San Diego Bay. The Patriot will provide thrilling 360-degree turns and spinning on a dime creating an exciting raw power tour of a lifetime! This is a 139 passenger boat. Is this ride only for people in good health? Yes, they should be in good health as it features speeds and other intense features that may cause distress or injury. We suggest you do not ride if your are pregnant, have high blood pressure, prone to motion sickness, have heart, neck or back problems or have had recent surgery. All guests, including those with disabilities or use a wheelchair, must be able to transfer into and out of the Patriot by themselves or with the assistance of a member in their party. If my child is under 4 years, can they still go? No, they must be 4 years and 40" (100 cm) or taller. An adult must accompany children aged 4 through 12. Passengers may get wet and are advised not to carry valuables while riding the boat. Flagship Cruises & Events accepts no responsibility for loss or damage to property. Do they operate in inclement weather? It depends; cruises may be canceled due to weather conditions.